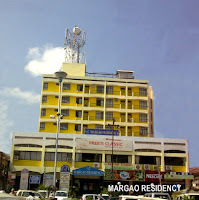 Margao Residency Goa is a GTDC Hotel which is run by Goa Tourism (GTDC) is situated in the heart of Margao city Goa smiling benevolently down on the heritage building of the 100-year-old Margao Municipal Council, the Margao Residency Goa, a GTDC Hotel Goa soars six floors up, offering the lucky guest a superb view of this charming city. The are 71 rooms in Margao Residency, which offers business amenities and a friendly atmosphere which makes guests feel right at home. This elegant hotel equipped with a mini conference hall, well designed rooms both air-conditioned and non air-conditioned. 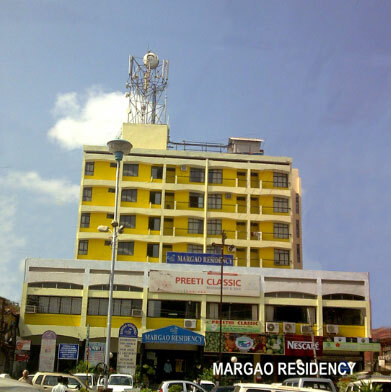 Margao Residency is 30 kms from Dabolim airport, 2 kms from Margaon railway station, Tivim railway station is 53 kms, Karmali railway station is 30 kms, Vasco railway station is 30 kms and Margaon KTC Bus Stand is 3 kms. There is a full-fledged bar and restaurant Preethi Classic which serving excellent cuisine of all types, Goan, Chinese, Continental. The restaurant has air-conditioned as well as non-air-conditioned areas. Take a trip to the Church of Holy Spirit built in 1564 over the ruins of a Hindu temple. Walk along the beautiful 18th century houses such as Joao De Figuereido house – having splendid collection of antique Goan furniture and the De Silva’s house – an impressive mansion built in 1790 having a façade with a roof once made up of 7 gables known as “Saat Burzan Ghor”. The owners demolished four gables since maintenance costs were too high.